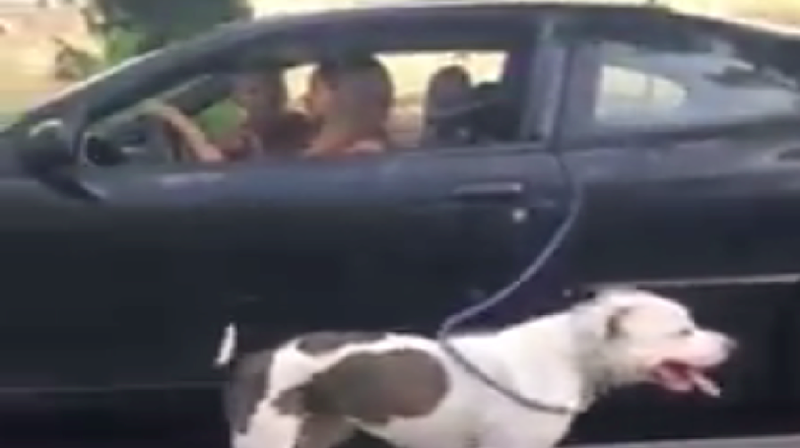 When a driver in California decided to walk her dog using her car, she got a thorough scolding from another motorist, CBS Sacramento reports. Watch as the less-than-brilliant dog owner struggles to justify her idiocy. Imagine you’re out one day walking your dog, when Rex, your pup, decides to roll all over that steamy deuce he just laid in the grass at the park. “Well damn,” you think, as you ponder how you’re going to keep digested dog food off your pristine Pontiac Sunfire’s seats. Milliseconds thereafter, a rational human being would extinguish that thought, realizing it to be among the dumbest ideas ever devised by anything resembling a human. And then there’s this person in California, who decided to just go ahead with the idea. Now, I have no clue if she went this route because of the smelly situation I alluded to above, or if she was just too lazy to walk her mutt, but the owner appears to have stuffed the dog’s leash into the door jamb, a move fit for only the likes of Clark Griswold. We have a lack of humane education not only for adults obviously in this case but as children as well children...If we don’t teach children that this isn’t OK, this is what happens. He went on to say he’s trying to identify the lady in the Pontiac Sunfire, and that he could theoretically recommend an animal cruelty charge. Roads are generally bad places for pets, and living things in general. Plus, who knows what might happen if he saw a squirrel run across the road.